After a long absence, the BHU soccer team has struck again….this time at a privately sponsored, local soccer tournament in the north of Hamburg. Even though some of our previous teammates have not been able to participate, the roster was replaced by some very talented new players, among them: Nobbi, Rainer, Jockel, Stephan, Nils, Michael, and Jochen. Anyway, our team consisted of young and old….well, mostly old, especially when comparing it to our opponents. Yet, our age was actually helping us out, because it turned out to be a battle of the minds with the younger teams, who were better at times, but our wits and Abgebrühtheit kept us in the game many times as we scored 4 of our 7 goals in the last minute, and thus won 2 games that way. As the tournament went on, so did our beer consumption….to the dismay of our opponents who were chastising us at times for unfair play, but really it was more our lack of coordination due to our beer consumption. Anyhow, our first opponent turned out to be far weaker than we had expected, yet we only managed a 1:0, a score that hurt us in the end, because we missed the semifinals due to a worse score difference. Although we didn’t play well, we were always in good spirits…..a sign of our closely-knit unit!!!!!! The next game, we played vs. the eventual 3rd placed team….we lost 2:1. However, both games did not compare to the secret Final of the day….our game vs. the “shirts”, a team of young hotheads. In other words a team of puberty-aged 15 year olds against the oldest team in the tournament…..yes, my dear reader, you guessed right, it was good vs. evil, old vs. young, matured good looks vs. zit-faced kids. The crowd was going wild as we scored the first goal. Impressed by their stylish looks, as they were constantly fixing their collars, we unfortunately had to concede a goal, so the game ended 1:1…..Honestly, they were probably better, but we played our best game and with our little theatrics, we successfully entertained our fans. The other game was an unspectacular 1:0. The game for the 5th place was a no-brainer as we won without problems. The tournament could be best summed up in statistics: 5 games played; 8 to 4 goals; one beautiful presidential fan, Steffi, and her loyal photographer Heiko (who both should be thanked here as they provided us with support and…. one case of Astra beer and a little water); one knock out of our MVP player Nobbi, who was put together by our president, fan and nurse, Steffi; a few scratches through forbidden slide tackling; one bicycle-kick goal by the best player of the tournament; 9 young soccer players who cared as much about their jersey collars as they did about their passing and scoring and most importantly, a great afternoon among friends. 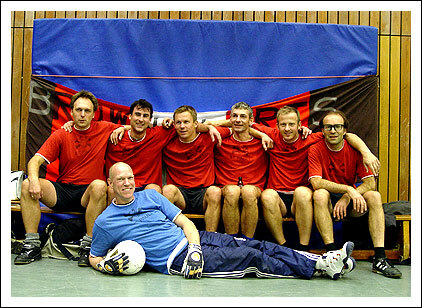 Even though this short report does not do justice to the fun of a Saturday afternoon, I hope it will encourage you readers to play or cheer on the BHU team for the next tournament, which will be on November 30 at the Alsterhalle here in Hamburg. If you need more information, please email Norbert Schmidt at ……. Ich hoffe es geht euch gut, ganz egal wo auf der welt ihr gerade seid! von Motivationsproblemen keine Spur, Laufbreitschaft über 90 Minauten, jeder wollte sich zeigen, viele präsentierten sich ja erstmals den Fans. Diese aufeinandertreffen unterschiedlichster Ausgangspositionen, Motivationslagen und Vorbereitungsphasen führte zun einem über 90 Minuten ansehnlichem Spiel, bei dem die Vorfreude auf die kommende regionalliga Saison geschürt wurde. Ein saftiggrüner, frischer Rasen (viel geiler als in der AOL Arena....;-)) und ein bis auf den letzten Platz ausverkauftes Haus bildeten den angemessen Rahmen für die kommenden 90 Minuten. Bayern wie gesagt ziemlich platt, Pauli mit fast nur unbekannten Gesichtern, die sich alle empfehlen mussten. Bis auf, ja bis auf Stani und Daniel Sager. Kurz, ein ganz hassenswerter Typ. Ich freue mich, weil er in der ersten Halbzeit über links spielt und sich somit mit Barzzo und Deissler (beide über rechts in Halbzeit eins) konfrontiert sieht. Ich hoffe auf mindestens 10-15 Flanekenläufe, damit Herr Sager mal sieht, wie schön Fußball sein kann. Leider kommt da garnichts über rechts bei den Bayern, Sager hält sich zu meinem Ensetzen ganz passabel, ein Horror. Der Staionsprecher stellt die meisten der neuen Vor, zu verstehen ist davon leider recht wenig. Ausser dass daniel sager gerne mal von Ottmar Hitzfeld trainiert werden würde-ich kotze. Über rechts schiesst ??? scharf auf die Bude, aber Kahn hält sicher. In Halbzeit zwo bringt Schlangen Franz dann ein paar sehr verheißungsvolle Testkandidaten., zwei Kroaten, einen Nigerianer, Polen etc. Malle und ich waren total von dem einen Kroaten (Nummer 25, 190-200 cm gross, jung, schnell, etwas Hüftsteif, wirkte unheimlich spielintelligent und erfahren) begeistert, aber auch sein Landsmann wusste zu überzeugen. Das die Bayern ca. 15 Minuten vor Schluss durch den Kullerball von ??? In Führung gingen war angesichts der hoffnungsspendenden Vorstellung einiger Akteure absolute Nebensache. Fazit: sollten sich die guten Eindrücke der Testspieler erhärten, wenn diese Verpflichtet werden und sollte die Innenverteidigung auf der gezeigten Leistung aufbauen können, dann spielen wir ganz oben mit (leider wohl mit D.Sager....). When you join a fanclub, undeniably you have been taken in by the barely controllable desire to express your love and loyalty to a team or club. It is not enough to just sit in front of the TV set and get a smile on your face when your team scores…no! You have decided, when life and money allows it, to enjoy this beautiful sport with a bunch of friends and fellow fans in the stadium and to go through the heights and depths of emotions depending on the outcome of the game, and do I not speak for all of us: Wasn‘t the recent past extremely energy draining as a fan for the most loved club in Germany: St. Pauli? From the heights of being the Weltpokalsiegerbesieger and her frequent visits in the 1. Bundesliga with its great schedules of Saturday games that in case of a win, provides one with the much used opportunity to successfully continue the great Millerntor experience at the bars and clubs at the „Reeperbahn nachts um halb eins“; to the more meager 2.Bundesliga and its Sunday games that instead of being the great excitement for the whole weekend, rather resemble the last fun event of the weekend before the Ernst des Lebens begins on Monday. Nonetheless, even though it wasn’t the 1. Bundeliga anymore, the Sunday games of the 2. Bundesliga were great as well, perhaps comparable to church attendance….after all, one goes with many other „believers“ to a place of worship….so in a way, the 2. Bundesliga, too, has had its positive sides for a St. Pauli fan. Unfortunately, these recent heights for the loyal followers of the „boys in brown“, were replaced by last year‘s dissapointing season that resulted in the loss of some good players due to mismanagement. but more importantly, St. Pauli was relegated to the Regionalliga. That was a hard hit in the face and the sounds of „hells bells“ (originally intended to intimidate the opposing team) was now threatening the bond between team and fans. 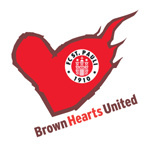 Even though frustration was the first reaction, the fans did not abandon the club; on the contrary, it spurred loyal fans like the brownhearts to make events like Saufen for St. Pauli to a Pflichtübung or a must-go event and Astra beer was drunk even by cocktail drinkers in amounts that should have helped to give the team enough money to easily have bought Roy Makaay and free him from the greedy clutches of Bayern München. Despite the negative sides the many other Retteraktionen represented, like the financial depths of the club, in the end it also showed something more important, the depth of our undying love that resides in our hearts, our brownhearts. Hopefully the last two wins against HSV (A) and Arminia Bielefeld are the groundstones for the beginning of a successful season in which the goal can only be: Wiederaufstieg! Niki sparked the idea and word spread like a virus: let's rent a bus and support the Club at its away game in Braunschweig. Phone calls were made, emails were sent and the organisational skills of the BrownHeartsUnited (BHU) were probed to the max. When the big day arrived, the Kiel gang had missed the train and arrived on the scene by cab (90 minutes, 80 Euros). Steffi and Katrin spent hours in the kitchen to prepare 40(!) sandwiches for everyone. In the end, 17 brave man and women boarded the rented bus at Dammtor Station, equipped with essential support gear (flags, skarves, whigs, etc.) and cases of Astra. It was a bright and sunny day and there was only one goal: help lead the Club to a very, very important victory. Two hours on the road to Braunschweig were an excellent opportunity to get to know eachother better since many of the BHU members met for the first time. It was also an opportunity to study our drivers closely, hard-core fashion victims with trend-setting hair-cuts and prison-stlye tattoos. Upon arrival in Braunschweig we were greeted by a friendly police man who escorted the bus to the stadium on his motorcycle. The actual game was a nervewracking thriller. A self-goal of Braunschweig's keeper in the first half heated up the supporters of both teams that were fighting hard but did not seem to manage to clear the way for more goals. In the end, FC St Pauli's fighting spirit paid off and the 0:1 win was proudly celebrated, in the stadium, on the bus during the ride home and at Burger King where the BHU was awarded the winner's crown. We deserved it! We returned to Hamburg at midnight, tired warriors after a won match, who parted in friendship and agreed that this trip was a true success. We shall meet again. We will win again. You never walk alone.